Take a step back into the good old days with Good Old Days email updates. Authored by Good Old Days magazine editor Mary Beth Weisenburger, this interesting update will be sent directly to you once every three weeks. The arrangement was profitable for both of them. She nurtured his courage and his curiosity. Why did his wife think this job was so hard? Eureka! Every driveway in the neighborhood needed some! Two years later, it was time to empty him. It was his dream car -- and his mom's too. They weren’t the kind that grew in her garden. Some were learned well after the harvest. Mrs. Miniver inspired a nation at war. Her nerves always tried to take center stage. A summer of hard work meant rewards in the fall. She was the first and she still has the proof. Those 45 minutes a day gave him skills to last a lifetime. Her prom outfit wasn’t complete without snow boots. Who would ever suspect what he was carrying? They made the quirky combination work. They pursued those peas with a passion. Mother wouldn’t notice, would she? They were five friends in need of five tuxes. What to do? Luckily, his grandma always remembered. What started as a secret ended as a news story. They didn’t let a little rain spoil their annual outing. It may have been wool, but potatoes made it possible. His actions spoke louder than his words. Surprise! Earning the money was the most rewarding part. Her career as an apple peddler ended on a sour note. Question: I have 10 heavy wood bowling pins that appear to be quite old. The paint is wearing off a bit, but they aren't cracked or missing any wood chunks. Can you estimate their age and current worth? Answer: Dutch settlers brought the game commonly called bowling to the New World in the 1600s as "ninepins." Eventually, a 10th pin was added. The American Bowling Congress, formed in 1895, standardized the game of tenpins. Pins are 15 inches high, weigh approximately 3 1/2 pounds each, are made of rock maple, and are shaped on a lathe. By 1974, all-wood pins were replaced by plastic-coated ones. Finding a full set of all-wood pins is unusual. Most were disposed of or destroyed when they became obsolete. They are not currently in high demand by sports collectors. When found on internet sites, the asking price is $50 to $60 for two or three pins. and SAVE up to 63%! The magazine that remembers the best. Good Old Days magazine is the magazine that remembers the best of times. Feature stories and photos of the good old days of 1930 through 1960 are all contributed by readers. This easy-to-read collection of memories will fascinate the young and the old alike. Print subscriptions available only in the United States and Canada. 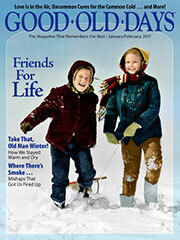 Good Old Days is published 6 times per year at the cover price of $5.99 per issue. Canadian subscriptions will be charged an additional $9.98 per year plus GST/HST if needed.